UPDATE: Sadly we received the news today that He Brews Coffee & Cafe is closed. I spoke to the owner on the phone, and she said that despite their recent coupon advertising campaign and niche market, they were unable to make the business work. They may continue with catering in the future, but there are no solid plans at this time. Mr. B. and I were on our way to eat lunch there today, and we are so sad to hear this news. This is a real loss for the Kosher, organic, vegetarian, vegan, and gluten-free community. When your diet is restricted for one reason or another it is always a joyous occasion to find a restaurant that caters to your specific needs. 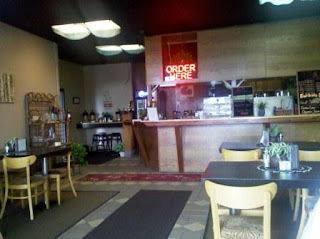 When I got a coupon in the mail for He Brews Coffee & Cafe, I jumped for joy when I read that they have "several menus to choose from" including "Kosher, Organic, Gluten Free, Vegetarian/Vegan, and Low Calorie (complete filling meals for 150 calories or less)." Wow! I felt like I hit the restricted diet jackpot. Mr. B and I clipped our coupon for a buy 1 get 1 free breakfast or lunch item and set out to jump the traffic hurdles of Lancaster Drive. How fortunate that the coupon caught my eye. Despite the clever name on the sign and multiple roadside sandwich boards, I never would have noticed this little cafe tucked in the back corner of a nondescript Lancaster strip mall. 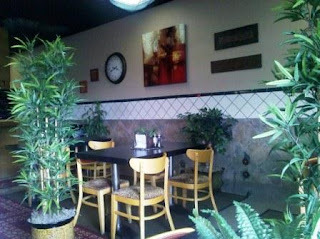 While the location was less than exciting, the interior has a cozy cafe feel. Carpets and plenty of greenery give personality to the generic space. There are plenty of tables and chairs to choose from inside the cafe, as well as just outside in a sky-lit corridor. Guests order from the counter and are served at their table of choice. As promised in the ad, they have multiple menus to choose from. The gluten-free menu is quite impressive. In addition to egg scrambles and oatmeal, their breakfast section includes waffles, pancakes and biscuits and gravy- all things that celiacs and gluten-sensitive folks have long since crossed off their mental breakfast list. While some restaurants offer one greatly appreciated gluten-free bread option, He Brews takes it to another level entirely. Their lunch section included an impressive list of sandwiches available on a variety of gluten-free breads, including prairie seed, multigrain, foccacia and sourdough. They also offer gluten-free pasta options. Mr. B. was so excited he could hardly stand still. Mr. B. and I were on similar wavelengths that day. 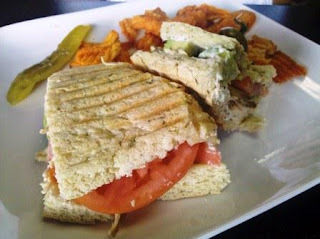 He ordered the chicken-avocado-tomato panini, with swiss cheese, garlic herb mayo, and lettuce on gluten-free foccacia. I went with a similar sandwich that subbed turkey for chicken and provolone for swiss. Both were served with gluten-free barbecue potato chips and a pickle. I was delighted to find that the turkey on my sandwich was shredded turkey breast that tasted like it came straight out of the oven, instead of the deli meat variety. The chicken on Mr. B. 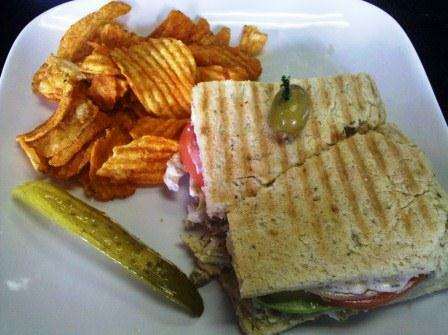 's sandwich was prepared similarly. The gluten-free foccacia had a delicious rosemary flavor and while lighter and dryer than standard foccacia, it was quite tasty. Both sandwiches were warm, but not quite the gooey-toasty-ness that I was expecting from a panini. The barbecue chips were tasty and the pickle was the tangiest most eye-watering dill pickle I have ever had in my life. If you are a vinegar fan, you must try these pickles. The service was good, though a bit disorganized. They opened in March and it seems they are still perfecting their process. They experimented early on with longer open times, but recently cut back significantly due to customer traffic. They found that most of their business came between the hours of 10:00 a.m. and 2:00 p.m., with fewer than 6 customers per day after those hours, so they are sticking to a 10-2 open time for now. Depending on demand, they may extend their hours in the future. We chatted a bit with the staff and thanked them for the awesome variety of gluten-free menu items, promising to return for breakfast next time. It is so exciting to see so many gluten-free options in once place. Their kosher, vegetarian/vegan, and low-calorie menus also looked quite extensive and worth a try. Thank you so much for this review! We're always on the look-out for places our daughter can eat. I just heard this morning that they are closing. :( I will confirm that information and update soon. We eat out all the time, and we just recently heard of this place - I think through this site. We were planning to visit this week - even before we saw the coupon. Too bad. Not a good location for a place like this. darn, was going to try this this week too!